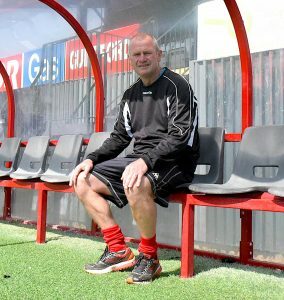 FOOTBALL: WOKING manager Alan “Dowse” Dowson has insinuated that he will read the “riot act” to any player looking to join the club in return for a cash-bonanza. The former Hampton & Richmond boss, who guided The Beavers to the National League South play-off final on, reportedly, a shoe-string budget, knows that there are plenty of players in non-league football who are solely influenced by the colour of money. Speaking to the News & Mail, Dowse said: “The money side of things is becoming more of an issue within the game, and not just at the top level. For the full article, see the 31 May edition. More football reports this week: Giuseppe Sole testimonial back on; Reprieve for Sheers; Cleen sweep for Knappers; Ex-Cards star dies; Harry Arter in line for big club move.